The software that Merchant Moms uses is set up for optimal search engine performance. As long as you have the proper codes, and the proper areas in your store admin filled out then you should not need much more to help your site with search engine optimization. In this article we will review the basics of setting up a fictional hair bow site for maximum search engine optimization. Displays the category or product if selected, for use with search engines. The codes above are the ONLY necessary codes needed for good SEO using the Merchant Moms software. After you are sure these codes are in your template, then you will need to change NOTHING in your template from this point on. Ok now that we know our target market we need to implement this into our store admin. We are going to break this up into 3 areas of the store admin area. 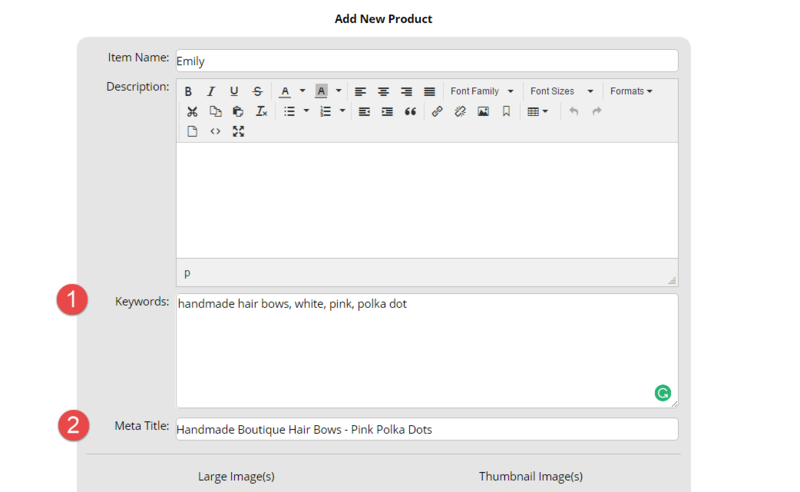 Pages, Categories, and Products. In your storeadmin click Web Site > Pages, then click to edit the page you want to work on. (2) Meta Keywords: Not used by search engines but is used for searches made on your site. The system uses the item name and these keywords to show search results. Add any extra words that aren't in the item name that might help a customer find this item when searching on your site. (3) Meta Description: This is a description of that PAGE. A common error is that people will put key words here. This is not proper use of this area. Most of the time, using the first few sentences on that particular page will work for your description. This will be show in search engines under your site name. Keywords: Enter any keywords that a visitor might type to find this category. The keywords are used for internal searches, or searches on your site. Either of these examples will work just fine, as it’s just a matter of preference. The purple highlight shows your Meta Title. The content is inserted from your category page content (which we will discuss at the end of this article) The second purple highlight area shows that this is a category page on their site that is being picked up by the search engine and not a product. Keywords: Enter any keywords that a visitor might type to find this item that aren't already used in the item name. The keywords are used for internal searches, or searches on your site. Meta Title: This is NOT the product name. As you see the bow I have shown above is named EMILY. But no one would ever know that unless they have been to my site. So in order to get the product searchable I have made my Meta Title Specific to the ITEM not its name. The First highlighted purple area is the Meta Title. The second shows that the name of her page was Happy-Birthday-Bows. Content is the most important part of your SEO on your site. You must have content on EVERY page. Just one or two paragraphs that are keyword rich will make a huge difference. Just be sure not to spam your pages with unnecessary words just for SEO purposes. You should have content on ALL of your pages, category pages, and product pages. 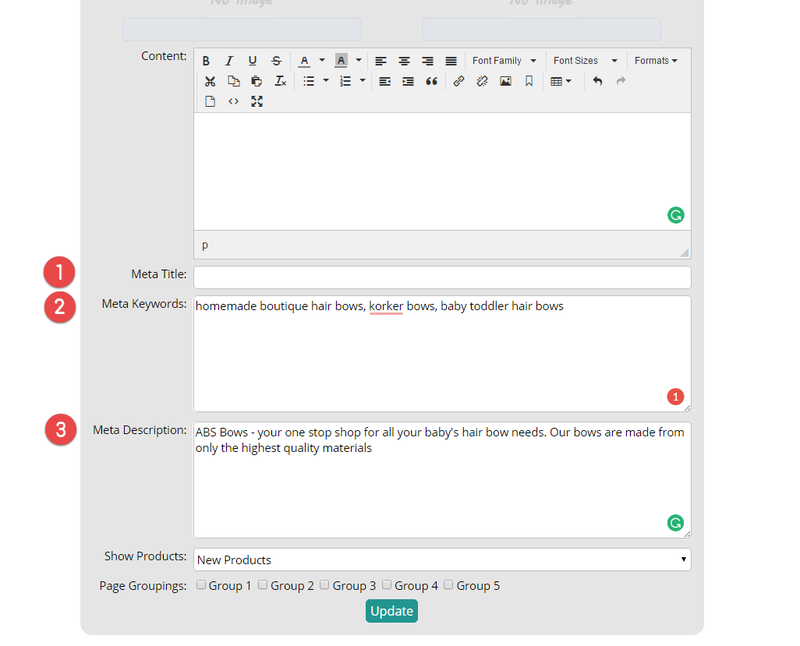 Basically if it’s an area you can edit in your store admin, you should fill it up with good quality content. As you can see the search engines use this content heavily and it shows on all searches engine results whether it be a category result or a product result. Incoming and Outgoing links are important. But keep in mind, these links should be of good quality or it will not help you much. If you link on a page that is not even on Google, then it won’t help because they won’t know it’s there cause they don’t know about the linked site. Try to find sites that will help in building you high quality links instead of sites with no significance to what you’re trying to achieve.